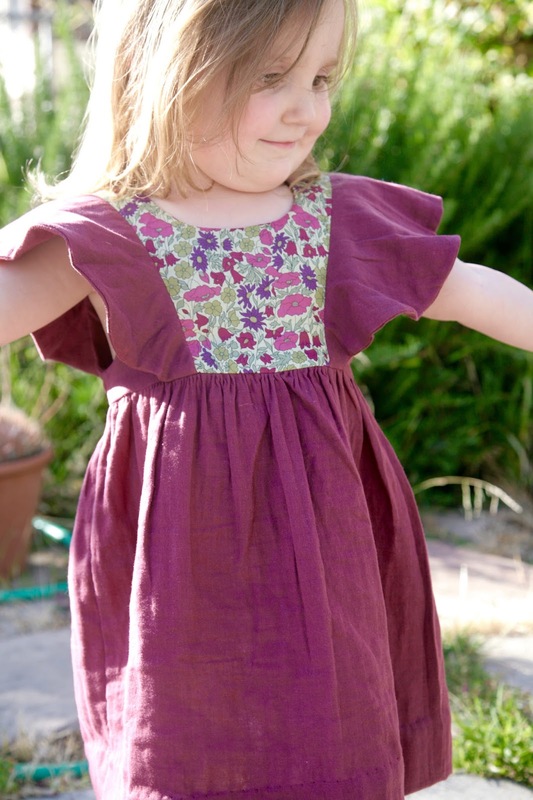 Inder Loves Folk Art: Kids Clothes Week Part 1: The Mori Dress. 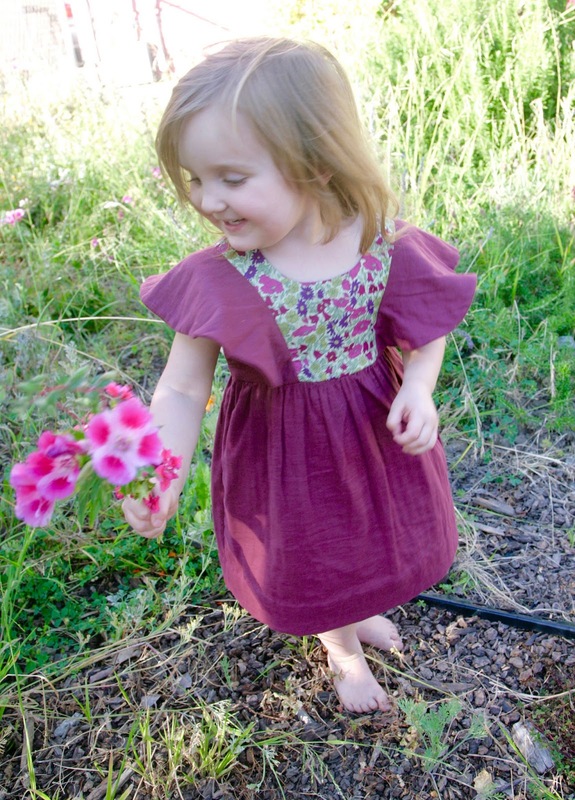 Kids Clothes Week Part 1: The Mori Dress. Hi everyone! Have you been sewing for Kids Clothes Week this time around? It has been a while since I last participated, and while I can't say I sewed for an hour every weeknight this week, I did sew quite a bit more than I usually do on weeknights (baseline: zero hours), so that's good, right? I fell in love with the Elegance and Elephants Mori Dress pattern the day it came out. If you've been reading my blog for even a short time, you know that I'm a sucker for little bodice ruffles and flounces. This design got extra points for ease, as it does not have any closures. Even so, I managed to resist for a short period of time, until I saw Rachel's Mori Dresses in progress (here and here). Aren't they stunning? When I saw those contrast yokes with the double-gauze, I was toast. I bought the pattern, and started plotting my own (copycat) version of the dress. Last weekend, I printed out the pattern and taped the pieces together. I knew I wanted to use this lovely magenta double gauze I have had in my stash for a little while now, but I wasn't sure what to use for a contrasting yoke (copycat!). Knowing Maggie's preferences, I was hunting around for something with some pink in it. Much to my delight, Maggie loved this little piece of Liberty of London I bought for a dress for her before she went through her ALL THE PINK!!! phase. Maggie's pink obsession seems to be lightening up a bit (knocking madly on wood), and she is much more open to other colors. The pinky-purple flowers on this Liberty lawn were sufficient for her pink needs. Anyway, back to the dress. If you know the name of this Liberty print, let me know in the comments, I do not generally keep track of such things, and I was unable to find it in an internet search. It's really pretty and goes perfectly with the muted magenta double gauze. 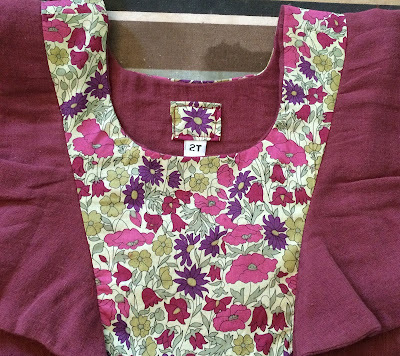 I lined the bodice in the double-gauze, so I needed only a small amount of the Liberty. 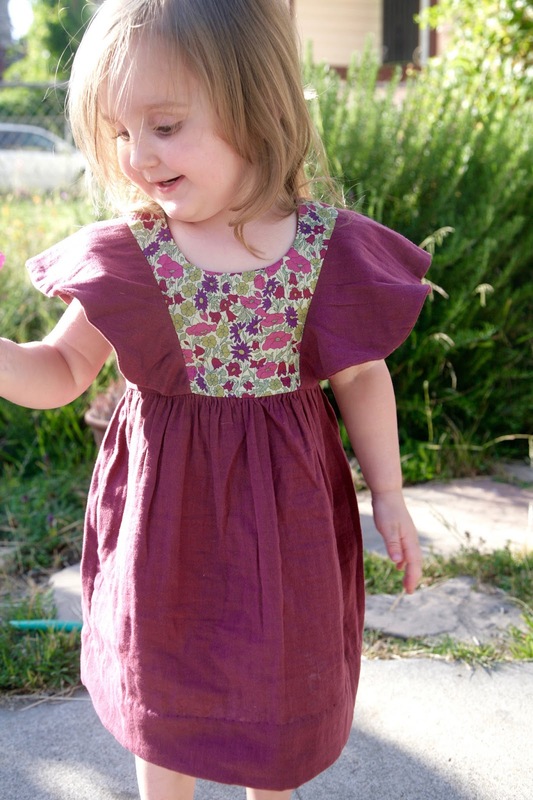 The fabrics make this a really special dress. I cut a size 2 with 3 length. It ended up seeming a bit large in the bodice, but the length is perfect. I used a deep hem so I could let it down later, and I am hopeful this will last through next year although it's a fact that Maggie is growing fast these days (I thought it would never happen! she's still really small for her age), so who knows? I took a little extra time (on weeknights!) to sew the bodice lining to the dress and hem it by hand. Such special fabrics seem to warrant slightly fancier finishings. I even made a cute little Liberty tag for this dress, forgive the cell phone photo and stained ironing board. 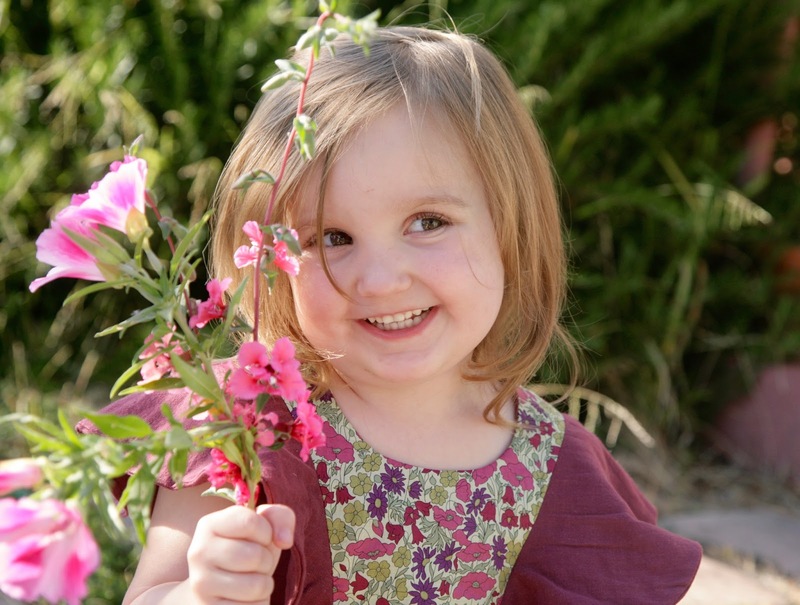 Maggie loves flowers, and loves to pick flowers or herbs from our garden. The lovelies that she is holding in these photographs came from a package of California wildflower seeds I threw into the garden. Mostly weeds came up but there are some pretty flowers too. I see some Godetia and Clarkia here, I believe. Maggie is interested in the names of the flowers and seems to have a good memory for them. 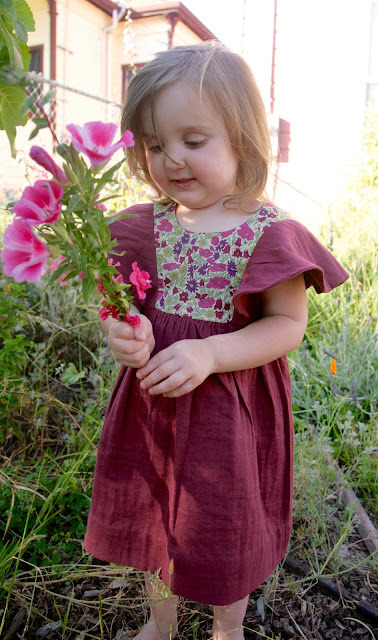 She loves to collect little bouquets and put them in water in the kitchen, keeping my kitchen stocked with jars of weedy little flowers. It's pretty great! Maybe she'll grow up to be a gardener and plant lover like her mother? You may chuckle, but I went through a hard-core gardening/wildflower/botany phase when I was in junior high and high school. While other kids were partying and experimenting with drugs, I was poring over field guides and books about English gardening. I almost majored in botany in college! (I ended up choosing anthropology, an even less practical career choice.) Anyway, if my children turn out to be huge nerds, they will have come by it honestly, poor things! The dress is gorgeous! It looks so pretty on Maggie! I love the flouncy sleeves on the dress and I'm sure it's lighter than air in the double gauze. I'm crossing my fingers for you that she stays open to colors that aren't pink! Oh the sweetness! I do love hiw a little bit of Liberty can go a long way. This is beautiful, and really suits Maggie. The dress is so beautiful. 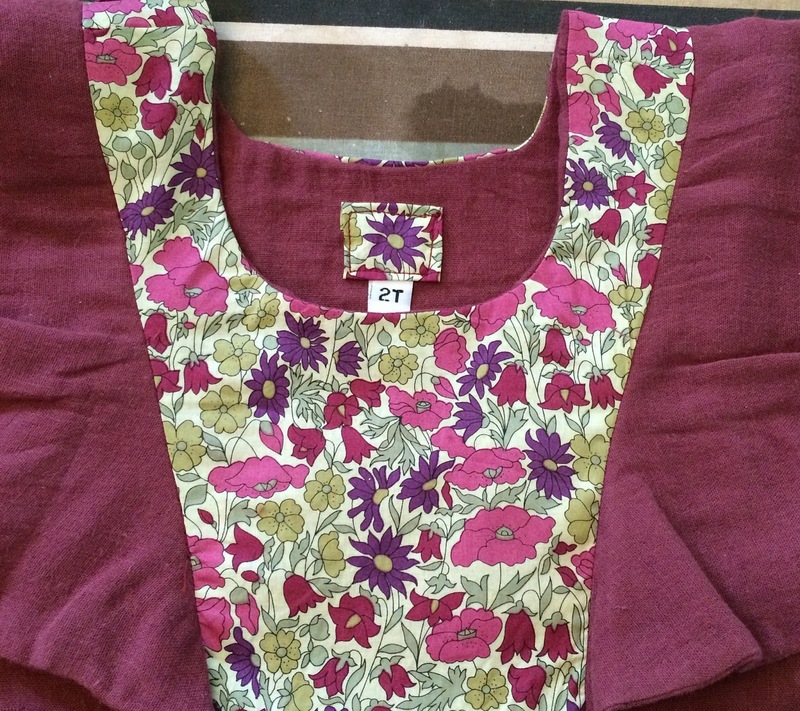 I was intrigued by the comments on the anxiety while working on the bodice. It made me so curious. Can you link the video they linked in the pattern? The concept is similar to the "burrito" method for finishing a shirt yoke, but even more mind-melting. The dress is stunning! 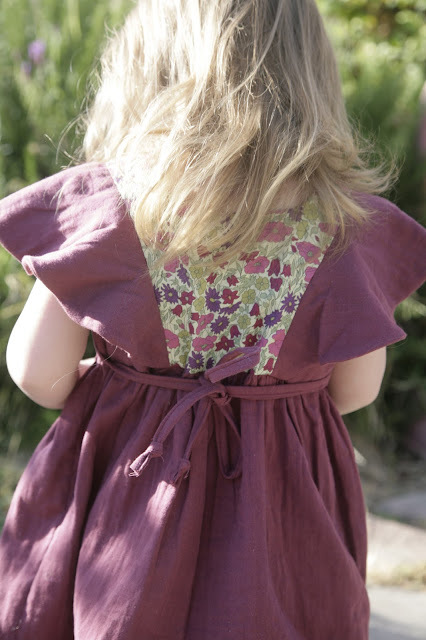 Love the colours of the double gauze and the liberty yoke. I must confess to being quite tempted by the Mori pattern and you've only made me want to sew it even more! Great dress! Perfect for flower picking. Those are some very special fabrics and Maggie looks so happy! I want one in my size! I love the combination of fabrics. That magenta is such a wonderful color. This is so great, Inder! I wouldn't call it a copycat version at all! I certainly didn't invent the contrasting yoke! :) Yours is amazing, and Maggie is adorable! Beautifully done in every way! My daughter's fave colours... I am going to copy you (and Rachel) haha Seriously, love it! Me Made May Part 1. Four Tees and Oakland Joe.